This May 3 to May 6, the Brooklyn Navy Yard’s Duggal Greenhouse is hosting the inaugural Smart Cities NYC conference and expo. Smart Cities NYC is ambitious in its scope, with a global selection of speakers whose backgrounds include government, the tech industry, academia, real estate/development, and design. Autonomous vehicles, public health, construction technology, resilient urban landscapes, and the Internet of Things (IoT) are just a few of the subjects being discussed. The Architect’s Newspaper is covering the first two days of the conference—see yesterday’s coverage here! Dan Doctoroff, C.E.O. 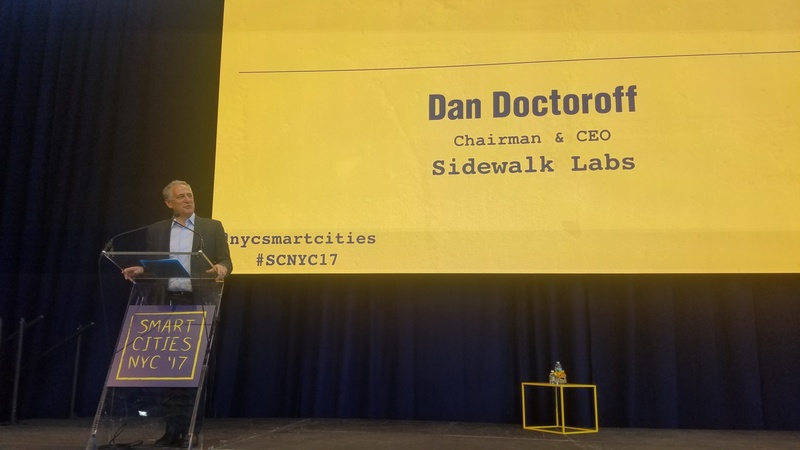 and co-founder of Sidewalk Labs, Alphabet’s urban innovations company and designer of LinkNYC, today laid out his company’s vision for driving smart city technology into the near future. Before delving into Sidewalk Lab’s goals and methods, Doctoroff painted a picture of an industry facing intrinsic challenges. “Getting things done in cities is really hard…. no city in the world does a good job of truly integrating the physical and the digital,” said Doctoroff. That’s why, he said, venture capitalists hadn’t invested deeply in smart city technology companies. Additionally, as infrastructure crumbles and cities become unaffordable, the public loses faith in government’s ability to solve problems. Yet, he believes that technological innovations in materials/fabrication, social media, machine learning, and related fields have the ability to revolutionize cities the same ways that steam engines, electric grids, and cars did in the past. Doctoroff then discussed an ambitious plan to accelerate the innovation process. Sidewalk Labs is “looking into developing a large-scale district” that would serve as a smart city technology testbed. The company is currently in the feasibility studies phase, and it remained unclear if this would be ground-up construction, but it sees this test bed as critical. Thanks to its district-scale size, it will attract an aggregation of innovators whose collaborations and synergies will create positive feedback loops of experimentation and success. Put differently, the sheer scale of the testbed will make its technologies greater than the sum of their parts. Once successful models are discovered, he predicted, they will be quickly dissimulated. He cited The High Line (a Bloomberg-era project that Doctoroff oversaw as deputy mayor) as an example of a globally and rapidly copied idea. Throughout his speech, Doctoroff often repeated that such innovations would only be successful if they improved quality of life, health, opportunity, equity, and other laudable goals. To that end, he outlined several specific areas where Sidewalk Labs was pursuing its ideas. One was the more efficient use of real estate; Sidewalk is currently looking into prefab modular housing, sensors that monitor building performance in real-time, and robotic delivery services that would reduce the need for residential storage space. Another area is mobility systems that would replace private cars, which Doctoroff said were a financial burden to many ($9,000 to $10,000 per year for a single family), as well as creators of sprawl, lethal accidents, and carbon dioxide emissions. Sidewalk Labs is exploring self-driving cars, car shares, optimizing existing road network usage, and the incentivizing of walking and biking. Sidewalk Labs’s third area of focus is sustainability. Most notably, Doctoroff cited a thermal exchange system in development that could capture buildings’ wasted heat, thereby reducing energy usage by up to 80 percent over a year. He also mentioned more familiar techniques, like greywater recycling and Passive House technology. A fourth area involved urban commons: the “public realm that is the city’s living room or backyard,” as Doctoroff put it. Innovations in that department included the use of retractable ETFE canopies to protect bike lanes and sensors that monitor air quality and the status of public assets (presumably benches, streetlights, and similar infrastructure). Lastly, Doctoroff referenced the “close-knit community that uses data to improve services.” This area of focus included ensuring universal access to broadband and undertakings like LinkNYC. The improved collection and analysis of data could improve healthcare delivery and new democratic forums. On the whole, Sidewalk Labs’s plans were ambitious and brimming with technological optimism, despite the challenges that smart city technology companies face. The question of top-down versus bottom-up efforts was a final and critical undercurrent of its vision: “You can never truly plan a city, you can [just] lay foundations,” said Doctoroff. How exactly that plays out, and where the public has an opportunity to shape and direct these technologies, remains to be seen.